As most of you know, St Jude's Children's hospital is a charity close to my heart. Every year I try to raise money for them. 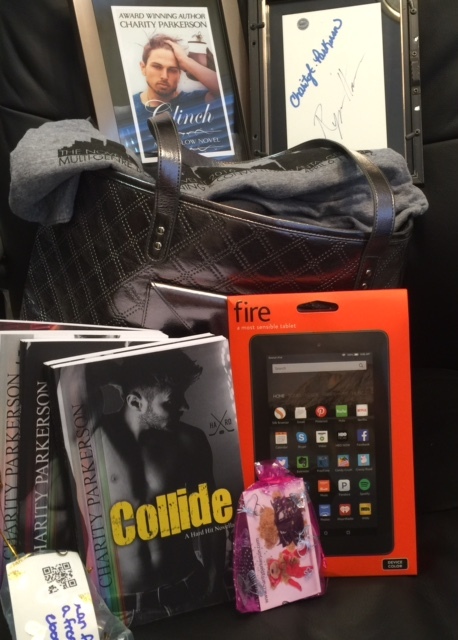 This year's silent auction basket contains books 1-5 of my Hard Hit series autographed, a Kindle Fire, two small swag bags, a carry on, a Novel Experience t-shirt autographed, and cover art for my upcoming book Clinched signed by the cover model Ryan "Stacks" Harmon and myself. Bidding starts at $150.00 USD and whoever has the highest bid on May 1st wins. I will contact the winner once bidding closes. Once your payment is made through Paypal, I will ship out your prize. Thank you! If you'd prefer to donate straight to St. Jude's, you can do that here.